Don’t shoot for the moon. Making small changes over time is proven to be the most effective to achieve lasting change. If you wanted to learn how to play tennis you wouldn’t expect yourself to be amazing and perfect after one week of practice. It’s the same with our wellness ambitions. Make practical, obtainable, simple goals, but ones that still challenge you. Don’t go all out in January, pace yourself, practice a new habit each week, or month as you continue the previous ones. For example, this week I may drink 5 glasses of water a day and next week I’ll go for six, working up to 8 or 10 per day. If you practice a new habit every month, after one year you’ll have adopted 12 new lifestyle changes. It may be slow and steady, but the tortoise won the race. We humans don’t just drift into healthy behavior (as much as we’d like to think we do, myself included). Plan for your week, month or year. Schedule meals, workouts, goals, rest and write out grocery lists. Get outside, be active, make it fun. It’s been said that the best exercise is the one we will actually do. But, planning is the first step. So, grab your phone, tablet, planner, chalkboard or old fashion paper schedule and write in one or two next steps that you will practice this week. Find joy in treating your body well, acknowledge what you can do, and not what you can’t. Our thinking directly affects our behavior. Studies show that people lose twice as much weight when journeying with a companion opposed to the lone ranger approach. We are stronger in numbers, and healthy endeavors are no different. Those days when it’s raining and we’d rather sleep in or eat potato chips on our couch in pajamas we need friends! People who care about us and have similar goals, it keeps us motivated. And also gives us someone to share in the struggles and celebrations. Don’t give up, get a buddy. Have a great, hydrated start to 2015! 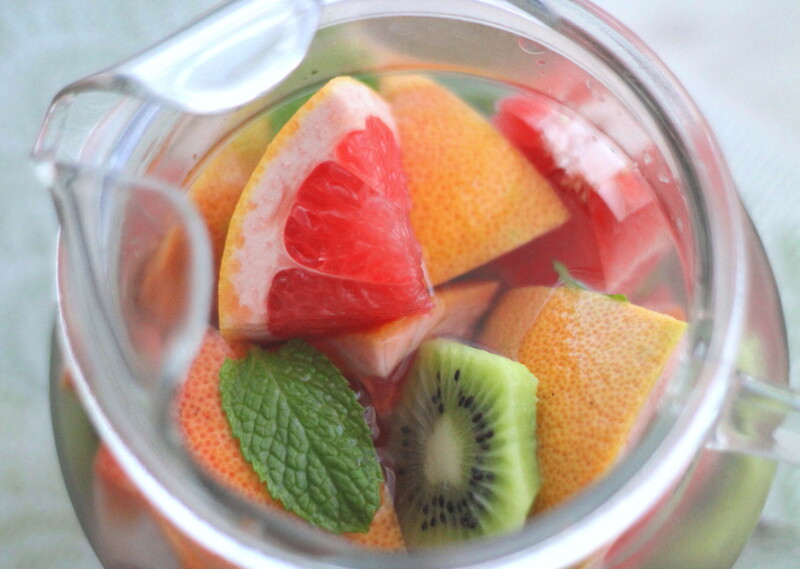 Cut grapefruit or oranges into large sections, slice kiwi and lime. 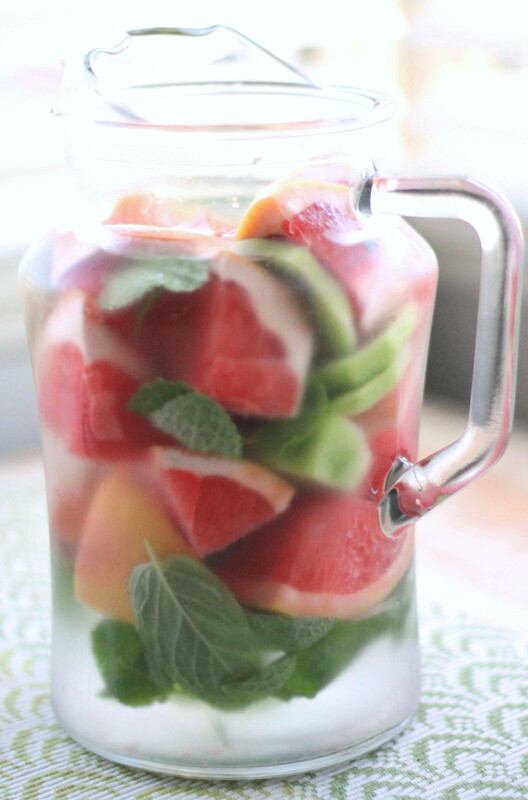 Place fruit and 15-20 mint leaves (or amount desired) into a large pitcher and fill with water. Cover and let set in fridge 8 hours or overnight. Add any favorite fruit.